Cava is Spain’s sparkling wine, the name coming from the word for cave, which describes the vast network of caverns that house and age this noble beverage. It was in 1872 that Josep Raventós first started experimenting with producing wine in a way that was being done in Champagne, France. As far as what Cava has in common with champagne, well, it sparkles and is made in the traditional method known as Methode Champenoise. Beyond the basic process of making sparkling wine, the two styles differ drastically. D.O. Cava (referring to a quality wine region) happens to be tied to a specific practice of winemaking, rather than a region where wine is made. Champagne can only be made in the French region of Champagne and in the traditional method, whereas in Spain, you can make wine anywhere that has proven to produce good sparkling wine, as long as you adhere to the rules of the D.O.. For this reason, many people often get confused and assume that all Cava comes from its traditional home of the Penedes, just south of Barcelona. It’s important to point out that these are the areas that are allowed to call themselves “Cava”, but there are also many other areas in Spain that make great sparkling wine that cannot be called Cava. In fact, even within the above regions, you’ll find wines that are referred to as sparkling wine. Why? 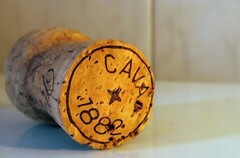 Mainly because the rules to make Cava are viewed by some as outdated and antiquated. Therefore winemakers choose to experiment and sell wine as a basic sparkling wine if they believe a rule broken can yield better results. Must age on lees in the bottle in which it will be sold for a minimum of 9 months, 15 months for Reservas and 24 months for Gran Reservas. These are the main rules and are followed by other minor rules, the process and the types of grapes that can be cultivated. To know Cava you need to know the big three grapes: Macabeo, Xarel.lo and Parellada, which are to Cava what Chardonnay and Pinot Noir are to Champagne. They give Cava the flavors and structure that make it unique and sets it apart from the crowd. Following these, you have Chardonnay, Subirat Parent or Malvasia Riojana. These are all white, and while you can use red grapes, they can only be used in the production of Rosé Cavas, and not in white wines like you have in Champagne. These grapes include: Cabernet Sauvignon, Pinot Noir, Garnatxa, Monastrell, and Trepat. Macabeo: Compact bunch and smooth skin. It produces a wine with a delicate aroma. In spite of its sensitivity to botrytis, it is resistant to spring frosts and its cultivation has been increased. Xarel.lo: Good acidity and consistency. This grape is number one in personality. Individual grapes are characteristically thick skinned making this grape resistant to pests and rot. Parellada: The least important of the three, its greenish grapes produce a floral aroma that is subtle. Parellada is harvested late and its acidity helps to counteract and balance Xarel.lo’s strength. It grows in the mountainous zones between 300 and 600 m. of altitude. So what is Cava like? Well, it’s clearly unique. Often said to have a more acidic edge to it, the newer wines I’ve tasted show more of the lush creaminess that you find in the wines of Champagne. For me, it usually shows flavors of citrus, green apples, raw nuts at times, and in the best of them notes of cream, honey and flowers. Styles range from: Extra Brut, Brut, Dry (sec), Semi-dry and Sweet. For the most part, there are a few brands that you can find just about anywhere and you probably have even tried them without knowing it. Freixenet and Codorniu are two of the oldest and popular Cava produces, and both offer Cavas that at the entry level have a great quality to price ratio. For around 10 euros or less you can find these wines in almost any wine shop in the world. Both offer great simplicity and are easy to drink. In a world saturated in high priced champagnes these little “sparklers” often do the trick and with less pain in the old pocket book. When you find you like it or if you just want to start at a higher price point you’ll be rewarded by trying the higher priced Cava. Cava does take a lot of time to produce, so sadly, you often have to spend significantly more to get a truly good Cava, more so than with many other wines. Names to look for include: Raventos i Blanc, Albet i Noya, Pares Balta and Mestres. Basically, Cava is a great alternative to Champagne. Not that I don’t love Champagne, but you need variety to make life exciting. And while you’re on it, why not pair it with a flavorful Spanish Paella. Or come visit! We have heaps of suggestions of great restaurants, bars, terraces and wineries to visit in our Barcelona Gourmet Travel Guide. Contact us now to book your private wine tour in Spain!